A. This machine is best suited for the following different trades: pharmacy, agriculture, food processing, chemical industry, alloy, metallurgy, geology and science research, etc .It can crush various kinds of herbals, precious medicine, ore and chemical materials. B. 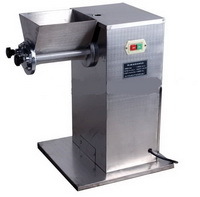 Collecting powder chamber of machine adopts the hermetic structure with eliminating noise. Therefore it can efficiently reduce noise while working. The machine sets up the device of reducing temperature, the operation will become more stable while reducing machine’s temperature. The speed of motor reaches 5000r/min. C. This machine is made of stainless steel, which has its characteristics of anticorrosion and abrasion-proof; it adopts the crushing method with impulse type to crush materials. The materials enter the crushing chamber later, and then impacted by six high-speed moving rams, stroked mutually between the geared ring and material. Finally the materials crushed by machine convey the powder bag through the sieve pore under the function of airstreams without any leavings. D. This machine has the following advantages: high efficiency, low noise, reliable and high quality, operating safely, healthy medicinal material and low consumption. A. The lumpy materials can be made to granular shape by this machine, after dried it, and can also crush the clotted materials. B. 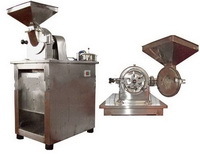 This machine is best suited in science research units, pharmacy, chemical industry, and food processing industry, etc.